Northern Power Grid have just issued a leaflet (available at the Town Hall) stating that in September they intend to build a new electricity substation at Hollins Place. That is the grass verge opposite the White Lion. This is a pretty place with trees, a flower bed and a bench where people can sit. I can't think of a worse place to put a substation. Surely there are other sights that don't flood that are less visible? Car parks, up the hillside? I have been notified by Northern Powergrid that the substation (not a box) will be 3 metres x 4 metres and 2.2 metres high. That is a substantial size, much bigger than the telephone box it was compared to by our councillors. Powergrid claim that they will put vegetation around to screen it. It will take an awful lot of vegetation. I found that the easiest way to register concern is through their Facebook site Northernpowergrid. "Northern Powergrid are investing in the power infrastructure in Hebden Bridge. They are wanting to make the power supply more secure and also flood proof. Currently the substation that supplies the centre of Hebden is located behind the fish and chip shop on Crown St and is about 60 years old, as is much of the cabling. This infrastructure is worn out, hence all the intermittent power supply problems in the centre of Hebden. Their plans are to re-route all the power cables, installing new underground cables along the route and to indeed situate a new substation at Hollins Place, as you say. I have been assured, however that the substation will look very similar to the telecoms kiosk that is already there in terms of size and shape; apparently, modern substations are small and neat and it shouldn't affect the amenity value of that area. There will be a few weeks of disruption to the town centre as the works are carried out but Northern Powergrid will be at pains to minimse the disruption, both to traffic, parking and power supply, and to ensure the works are carried out as quickly and efficiently as possible. There will also be a dedicated phone line and an operations manager on hand to help make sure things run as smoothly as possible. I will be happy to meet with you and any other residents who would like to talk more about this." There seem many unanswered questions about this installation not the least of which is its actual size. Is it like two mice or two elephants? Northern Grid do seem to be altering the answer depending upon who asks the question. Has Northern Grid already bought it and does it have some form of compulsory purchase rights? Is planning permission needed or do they have some kind of exemption? If so has it been granted? Is there no possible alternative such as the derelict carpark on Valley Road or the rubble patch on Stubbings Holme Road? What are the exact physical selection criteria for siting? Perhaps Cllr. Courtney could do a bit more than repeat a press release and provide some answers to the above queries. After all, this proposal will do more than destroy a pretty little patch of land. It will also bring disruption right through the centre of town. The regime however recognises that full planning permission may not be needed for all types of development and we benefit from a range of permitted development rights where the installation is to be on our operational land, i.e. land in which Northern Powergrid holds an interest such as freehold or leasehold for the purposes of its distribution licence. Permitted development is usually for installations with low visual impact and many of our substations are small enough to take advantage of the statutory leeway. This does not however mean that we can avoid consultations and we do have an obligation to consult the planning authority in many cases. Installation of small substations (up to 29m3 in size). Installation of underground electric cables. The thread reports the new sub-station would measure 3m x 4m x 2.2m. This amounts to 26.4 cubic metres, less than the 29 cubic metre threshold that it seems would be 'permitted development' and exempted from any need to obtain planning permission. "Regarding the substation, all of our substations are around the size of the proposed new one at Hollins Place as it wouldn’t be possible to fit all of the required electrical equipment into anything smaller. The new building will be adjacent to the telecoms box. "This location was not our preferred choice, either from an engineering or accessibility perspectives, but it is the only option of a suitable size and proximity to the town centre available to us. We did investigate a number of other locations, but had to rule these out based on not receiving the required permissions or because they were too small. "Taking the location into account, our design team has placed the structure behind the existing contemporary bus stop to reduce its visual impact. A non-standard textured green finish has been selected so that the building blends into the green surroundings and a complementary planting scheme is being commissioned from the council to provide screening. "We do understand your concerns and would like to stress that if there was another location available to us that was technically feasible in terms of network architecture, we would certainly reconsider our plans though this may result in a delay to the existing timeframes." While this is not ideal it is clear that the electrical infrastructure in central Hebden Bridge does need to be upgraded and the new substation needs to be out of the flood zone but very close to this part of the centre of town. I am very keen for the proposed area to retain its beauty and charm, and I will try to ensure the proposed screening is appropriate. However, if an appropriate alternative solution is suggested, I would be happy to recommend this to Northern Powergrid and encourage them to take that option. How about situating the sub-station further along Commercial Street, beyond the junction with Birchcliffe Road? The verges on both sides of the road are wide and accessible. I reckon it would fit near the Old Town bus stop without causing offence, or blocking the view of the junction, or being at risk of flooding. The existing proposed site is not only attractive as it is, but it is sensitive in terms of both Conservation and Local History, being right next to the remnants of the original cobbled Packhorse route and right opposite the venerable entrance to the White Lion. It's just not an appropriate setting for a substation. Please think again. I have made some suggestions for a better place to site this - one being the same as Julie's. I have been told that it is on the agenda for discussion at the next meeting of Hebden Royd Council on 15th August. So please raise your concerns and ideas before then. the installation work has been sub-contracted by NP to a company called Freedom Group. From this information, I believe that Calderdale Council is responsible for the decision to site the substation in Hollins Place. NP are not particularly keen on that site. Locating it in the carpark would suit them better and render the substation more effective, as it would be a little nearer to the heaviest users (shops and businesses in the town centre) It would also have far less visual impact and not risk damaging the wonderful flowering trees or spoiling the view of our town's oldest buildings. I have sent this information to our Hebden Royd and Calderdale Councillors, requesting that they ask Calderdale to reconsider their veto of Lees Yard as the new site for the substation, so that NP can construct it there. Action is urgently needed, as work is scheduled to start in a little over 4 weeks. Lees Yard is clearly a much better location than that currently proposed. 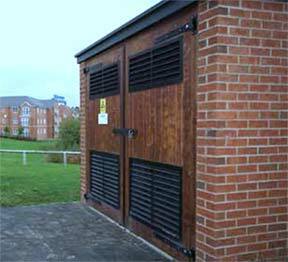 A substation 3m x 4m will take up less than 2 parking spaces. Is Calderdale really going to sacrifice pleasant town centre green space for the revenue from 2 parking spaces? Our elected members should be applying pressure on this one! The questions continue to pile up about this extraordinary plan. The latest is just what financial return Calderdale Council expects from handing over what is, in effect, our land to a private monopoly company which makes large profits by supplying electricity. Does it sell the land or just rent it? What level of rent does it apply? The extraordinary revelation that a better site was blocked because it would reduce revenue from parking charges raises the thought that Northern Power are getting the land free!!! Surely not!!! Come on Cllr. Courtney. This is not a matter of publicising Northern Power's views. It is a matter of Council policy which you, surely, have been informed about. What actually do you know about the negotiations between Council officers and Northern Power? Incidentally, in case anyone is in doubt as to what a substation looks like here is a picture of the recent one in Victoria Road complete with elegant tiled roof. Just to be clear; the frontage of the station in the photograph is 3.5 metres so is slightly smaller in width than the 4 metres of the proposed unit. It is also clear that no screening can be placed in from of the doors and that these will have to have a paved passage to the road. So much for hiding it with tasteful vegetation! Wouldn’t a better place be in the walled-off square of land behind the new storage units for the market ? As far as i can make out it is useless space which will ultimately become overgrown and a litter magnet. The wall fronting Lees Yard / Market Street would need to be removed but it would cause less of a visual impact and would make use of currently vacant space. Adrian - yes indeed, it would (let’s call this location the ‘holly trees pit’.). I’ve been out and measured it, and there is an area 5m x 4m within this (not including the two planted trees) in which a substation could be located - more than enough room. It’s in the same general location, at about an equal level above any flood line, and most importantly is nicely tucked away so that the substation would be visually inconspicuous. The idea that a substation could be located on the green area behind the bus shelter is preposterous. From every conceivable angle it would be a jarring and permanent intrusion into our cityscape and conservation area. In the aftermath of devastating floods there will of course need to be changes to essential infrastructure to make it more resilient, but these will always need to be designed and situated with great care, so that they don’t result in blighting the heritage which residents value and visitors pay to experience. As we continue through the process of necessary responses to the flooding it will be really important for councillors and officers to be watchful that technical proposals are not brought forward or approved which pay insufficient attention to such judgements. The proposed neighbourhood plan - which should be available for informal consultation quite soon - is still waiting to be consulted on the Environment Agency’s developing proposals for the town centre flood alleviation scheme; every design detail - including proposed tree removals, wall heights and finishes, let alone larger scale barriers - will need to be scrutinised intensely until everyone is satisfied they meet the necessary quality standard. If (according to Gwyneth Morgan) Northern Powergrid themselves don’t particularly like the ‘bus shelter’ site then we need to invite their design engineer Dean Hoyland to a site visit so that collectively we can identify a location that better suits all of our wishes. "...intrusion into our cityscape". Cityscape? Really? City?? And there was I thinking I lived in a smaller than average town nestling in a valley in the Pennines! I can't contribute anything to these masterful responses but was very dismayed to read of the situation via this thread, and fully support the concerns raised and the action being taken. I think this would have been a very much regretted placement of a great big new substation on this conspicuous and very pretty site, and hope this can now be averted and a good solution found (the holly bush site seems a brilliant solution to me). Just a big thank you to those who have raised and publicised this matter! So, thanks to Adrian Crowther, we now seem to have what should be the perfect solution - the holly pit as the site for the substation. Come on councillors, get your act together and persuade Calderdale not to allow Northern Power to spoil the prettiest bit of town. Gwyneth Morgan in an earlier post has already reported that NP would have preferred not to use Hollins Place. I am in communication with both Calderdale and NPG, and I can report that NPG are re-visiting the siting of the substation. Lees Yard is likely to not be in the running as it is too low down, re flooding, and also there is the problem with revenue loss. The holly tree enclosure is a possibility, but I was told the engineers believe they would have to fell the trees in that enclosure in order to put the substation in - which I'm guessing would also cause consternation. NPG have said if any trees do have to be felled they will plant new trees to replace them. However, I think the best option would be if we can avoid having any trees felled in the first place. I have offered to meet representatives from CMBC and NPG on site to look at options, for example the area on the other side of Lees Yard Road. It's great that people are coming up with some alternatives - it's really helpful. I will post with more updates when I can, but if I don't post on here it doesn't mean that nothing is happening. It just means I'm busy! Also my aim is for all the pros and cons of the different decisions to be shared openly, so everyone can understand how and why decisions have been made. I am hopeful that a solution can be found that is agreeable to all. Sarah – we’re making progress (but first of all I need to thank Kez for pointing out my slip of the pen. I did indeed mean ‘townscape’). The Holly Pit remains the best location, regardless of the initial comments of Northern Powergrid about potential difficulties with trees. When I measured it (on Thursday) the internal dimensions of the side parallel to the market stalls container is more than 5 metre long, and in the opposite direction - towards the trees - there’s a 4 metre space before the branches begin to overhang. So the question becomes: if Mo’s original post about the dimensions of the substation is accurate (‘3 metres x 4 metres and 2.2 metres high’), can we and NP determine if/how it could be oriented in that larger space, with effective access etc, whilst preferably leaving the trees in situ. Sarah - if you are able to arrange a site visit with NP please do contact me and let us all try and establish an optimum solution. As I mentioned in my previous post this is the first of many such post-flooding design/location decisions, every single one of which will require proactive scrutiny. The next one will be open for public consultation next Wednesday 8th August between 3-7.30pm at Hebden Royd Methodist Church, when the proposals for the first section of the main Hebden Bridge flood alleviation scheme, covering the Stubbing Holme road area, are available for comment. We realise that Cllr. Courtney is busy but it would help if she could answer some very simple queries, none of which require reference to Northern. 1) Was the Lees Yard site the original proposal of Northern which was rejected by the Council? 2) If so, was this rejection based only upon the loss of parking revenue? 3) Is the Council proposing to require any financial return from Northern for the land they use, wherever it is, either capital revenue from sale or from rental? 4) Does she accept that the picture of the Palestine Road substation is a reasonable likeness in size to the proposed Hollins station and that the requirement to have a paved access to a highway from the doors means that shielding by vegetation is impossible? These are simple questions and could be answered in a few sentences. 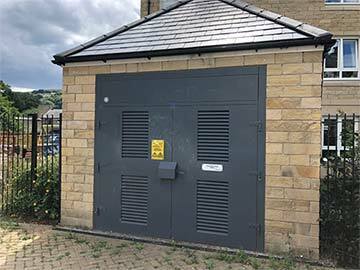 Please supply all communication between the Council and Northern Power Grid concerning the installation of an electricity sub station at Hollins Place, Hebden Bridge and all internal discussions within the Council concerning this matter. So, it appears the NPG have not consulted the Council about their intentions and plan just to go ahead and build their sub-station on Council land without obtaining permission. Or perhaps permission was obtained over the telephone. This is an update on the FOI request I made concerning the proposed sub-station installation on Hollins Place. This one read "Please supply all communication with Northern Power Grid about relocation of electricity sub-station and associated electricity works in Hebden Bridge and all internal communication inside the Council concerning this issue." Discussion took place between Council Officers and Northern Power Grid (NPG) throughout 2016. No councillors were informed as, apparently, because the proposed site would be leased there was no legal obligation to inform them (!!!). The Lees Yard site preferred by NPG was rejected solely because of the loss or parking revenue from 2/3 slots. Flood problems were never raised. NPG paid £2000 lump-sum for the Hollins lease which was signed. Cllrs. Young, Fenton-Glynn and Scullion were invited by NPG on 18 June to discuss the siting with them. Cllr. Scullion turned down the invite; it is not clear if either of the other 2 attended. Objections the Hollins Place site were raised by Cllr. Courtney on 8 August following representations by constituents. This included the suggest that the so-called Holly Pit would be environmentally preferable as would one on Cheetham Place. This last site was rejected by NPG as too small. They would accept the Holly Pit but it would require felling the mature trees there. The letter by Cllr. Courtney followed by a site visit is the only evidence of Councillor involvement. The documents provided stop at 28 August, the date I made the FOI request at which point no decision appears to have been made. Things have obviously moved on and we will soon know just where the sub-station will go. Well, the work is well underway and, notwitstanding the loss of the trees, the substation would seem to be in a far better position than if it had gone behind the bus stop. It would have virtually filled that grassed area and would have been a horribe eyesore. I understand trees will be planted to hide the structure as much as possible and the paving stones will go right up to the doors, making even more space for the market stalls. It's nice to see that common sense has prevailed (for once). It's an ugly brute, but far less intrusive than it could have been. Thanks to everyone who pushed for this solution, and of course Adrian for coming up with the idea.